After hours in the kitchen garden much remained to be done after Saturday. Garden work began at 6 a.m. I moved to the kitchen at 3 p.m. and worked another four hours. I was steadily busy throughout waking hours with only water breaks to sustain me. I harvested kale and weeded the plot, replanted a failed tomato plant, weeded carrots, dug up two small plots to plant cayenne pepper and eggplant, harvested collards and put temporary fencing around them. I mowed the fifth plot and spaded soil in about a third of it. With the near 90 degree temperatures, I picked lettuce before it had a chance to bolt. In the kitchen I cleaned lettuce, collards and kale and made dinner of a big salad. I steamed and froze the collards and emptied the ice box of every bag of greens and went through them. The goal was to make soup stock with the cooking greens. It was a dish too far. Organized, they went back into the burgeoning ice box. The highlight of the day was unexpected. The sugar snap peas are four feet tall and began to flower along the tops — as if an artist daubed white paint on a canvas, impressionist-style. I stopped and looked from different angles as sunlight faded flowery details. Beautiful. I harvested 12 kale plants and weeded the plot. It yielded two full tubs and more. I made a box of 24 leaves for the library workers and washed the small scarlet leaves to put them away. 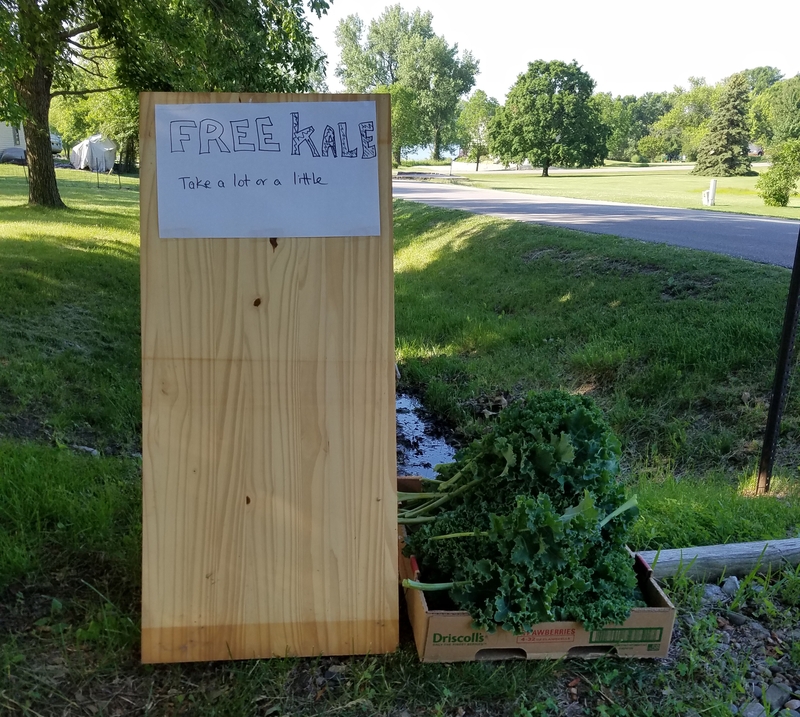 I put some of the abundance by the road for neighbors and passers by to take. It was the city-wide garage sale day so the expectation was bargain-seekers would find this spot. It was gone in less than 15 minutes. After a shower and clean sheets I slept eight straight hours. On the plus side I was so engaged in our kitchen garden there was little time to think about much else. At the same time it was difficult not to feel like little got done despite evidence to the contrary. Well-rested, the weekend cycle of watering, weeding and planting starts again. It’s what we do to sustain a life in a turbulent world. This entry was posted in Garden, Local Food and tagged cooking, Garden, homelife, kale, local food, sustainability. Bookmark the permalink.